Post # 210 Who Loves Ya, Rice? Okay, so everyone knows I like rice. What’s not to like? It’s good stuff. It’s inexpensive; it’s tasty; it’s healthy; it’s fun! It takes on a different flavor and bouquet with each different cooking method. It can be a main course, a side dish, a dessert, a starter, or a salad. 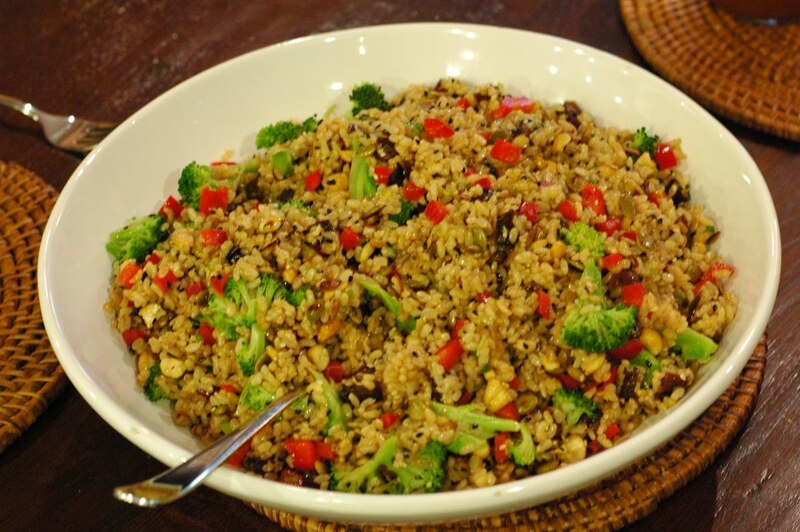 So I’m going to give you some of my favorite rice recipes to create an entire dinner featuring rice. Sort of an Iron Chef kind of thing! Okay, this doesn’t really involve porcupines. Take one pound of hamburger and add a teaspoon of salt, a tablespoon of Italian seasoning herb blend, a quarter cup of UNCOOKED rice, and one egg. Mix it all together and form two dozen meatballs of a tablespoon in volume. Heat a tablespoon of olive oil in a skillet and fry the meatballs in batches, rolling them around to get a good crust all over. Remove the meatballs and drain the pan. Heat a medium size can of tomato sauce in the skillet. Add a tablespoon of brown sugar, a teaspoon of dried basil, and tabasco sauce to your taste. Bring to a simmer, add the meatballs, and cover with a lid. Simmer for about 45 minutes, moving around occasionally to keep from burning or sticking. 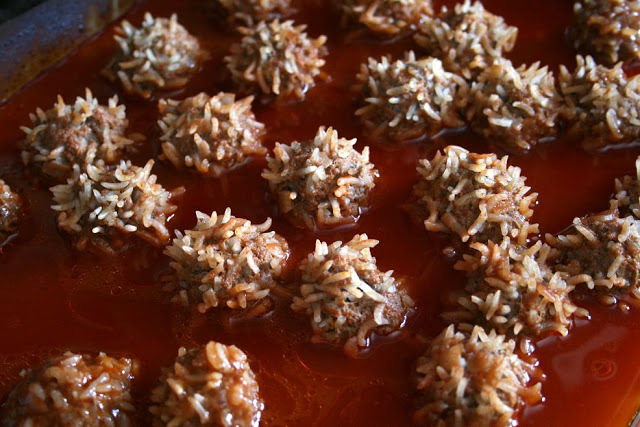 The rice will swell inside the meatballs and poke out like porcupine quills. Serve in a bowl with some sauce over the top. Heat oven to 375. In a 13x9x2 glass baking dish, spread one teaspoon of oil to coat evenly. Add two cups uncooked long grain white rice. Add two cans of chicken and rice soup. Add one can of cocktail shrimp with the juice. Add two small cans of button mushroom pieces with the liquid. Add 1/4 cup each of frozen corn, peas, and carrots. Add one can of tuna packed in water, including the water. Add two cups of chicken stock. Add 2 teaspoons of minced garlic and one small onion minced finely. Mix thoroughly. Place two large fish filets of any kind over the top of mix and cover with foil. Bake for an hour and check to see if the rice is done. Add more chicken stock if necessary but the rice pilaf should be dry when finished cooking. Remove from oven and carefully remove foil. Break fish filets apart and fluff rice with fish. Sprinkle with parsley. Serve medium warm. I like to put parmesan cheese over it, but I’ve been told you’re not supposed to mix cheese and fish by women who seem to know what they’re doing. In Italy. Naples, in fact. Mix one half cup cold cooked rice with chilled grated cheddar cheese, and several of your favorite raw vegetables. Add your favorite vinaigrette, preferable one with a fruit base, such as raspberry or blueberry. Chill for at least an hour before serving. There are all kinds of sweet rice desserts from old fashioned rice puddings, to new-fangled Rice Krispy Treats. Every culture has it’s own favorite. Korea has the sweet rice balls (about which I’ve written before), to sweet rice milk in the Philippines. I’m going to tell you about a baked rice pudding that’s almost a custard. It’s so good, I’ve had this with ice cream and berries in almost a sundae kind of treat. 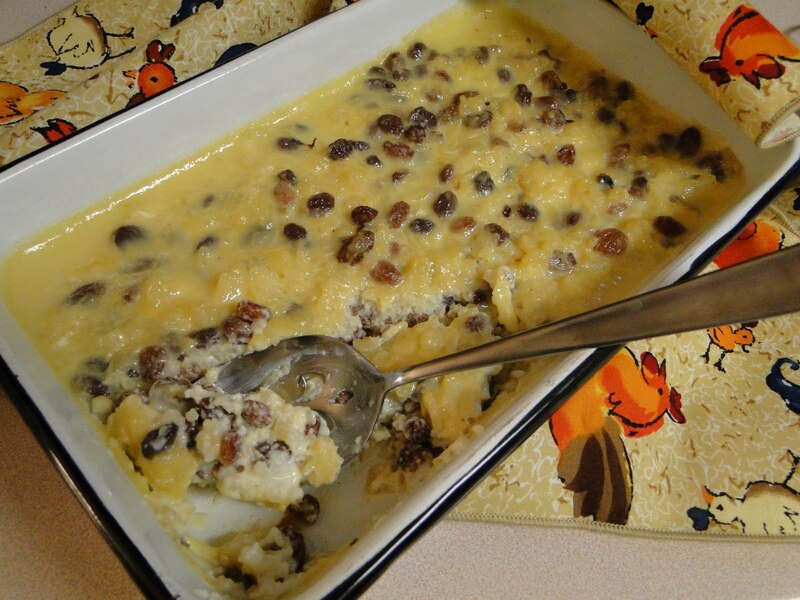 Take four eggs and beat into 3 cups of milk with 1/2 cup of sugar, 1/4 tsp of salt, 2-3 tsp vanilla, 2tsp grated lemon zest, and 1/2 cup or more of raisins if you want them. I don’t, so I use frozen blueberries most often. Once it’s all mixed pour it into a 2 1/2 quart baking dish that’s been buttered. Set the baking dish into another larger pan in a 300 degree oven. Gently pour piping hot water into the outer pan to half way up the baking dish. Be careful not to get water in the pudding. Serve hot, warm, or cold, with whipped cream, ice cream, pound cake, chocolate sauce, or any other thing you can think of that makes it taste better! So, I love rice, and just made an entire meal out of rice and rice products. Please let me know what your favorite rice meal is.